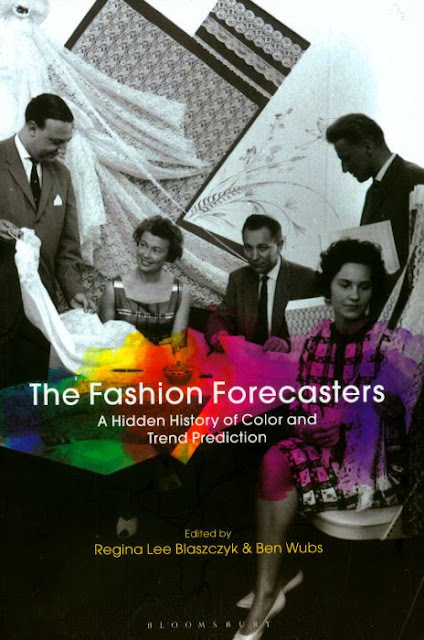 “A Hidden History of Color and Trend Prediction,” describes a new book by Regina Lee Blaszczyk and Ben Wubs. It is especially interesting to me because I helped to create and develop this clandestine career, forecasting fashion trends…or as it came to be known, “trending.” The book is an extensive investigative expose, authentic and as informative as a comprehensive college textbook. Chapter 4 is my own story, word for word as interviewed by the author. The book is a deep dive into a little known sector of the international fashion industry and I can vouch for its validity…because I was there! Available from Amazon.com for $31.95. A new book that explores and explains the inception and development of Fashion Trending. Until May 5th the FIT Museum in NYC is exhibiting a fascinating history of the role that fashion plays in the ever-changing idealization of the body beautiful. In the museum’s secondary gallery space, the visitor can easily follow the evolution of the fashionable silhouette. Entitled “The Body: Fashion and Physique,” the exhibition begins by displaying the extremely curvaceous ideal that prevailed for several centuries with somewhat subtle shifts. The basis was mature and womanly, an hourglass with natural shoulders, plump breasts, small waist and generously convex hips, stomach and buttocks. The 20th Century saw more dramatic silhouette changes than ever before, virtually a new ideal body shape for each decade. The “Gibson Girl” hourglass ushered in the century and that voluptuous shape became more relaxed with a slightly raised waist and wand-like silhouette taken to an extreme by the hobble skirt. Post WWI fashion was an extreme declaration of liberation that culminated in the shapeless, dropped waist and the shortest skirts in all fashion history. Soon the skirts lengthened again, grazing the ankle and the naturally delineated waist returned for the streamlined silhouette of the ‘30s that became more stolid and structured as WWII shortages came into effect. 1947 brought “the New Look” and a return to the emphatic femininity of a time passed. The ‘60s was a decade of rebellion as a younger generation led fashion to a little girl look with a boyish body and mini-skirts. Designer brands defined the ‘70s with individual statements of multi-trend expressions. The ‘80s was a decade of excess and extravagance, whereas the ‘90s sank into a depressing downbeat of Minimalism and casualwear. The 20th Century ended without a definitive fashion silhouette. Instead, the new Century seems to be desperately seeking newness but is trapped in an endless anti-fashion recycle of the past again and again. What will the ideal body look like as fashion heads towards 2020 visions? 1800’s high-waisted Empire line followed by balloon shapes and the enormous crinoline. The bizarre bustle, then the hourglass and the wild liberation of the Roaring Twenties. The ‘60s “Youthquake”grew up to power dressing and oversize anti-fashion. 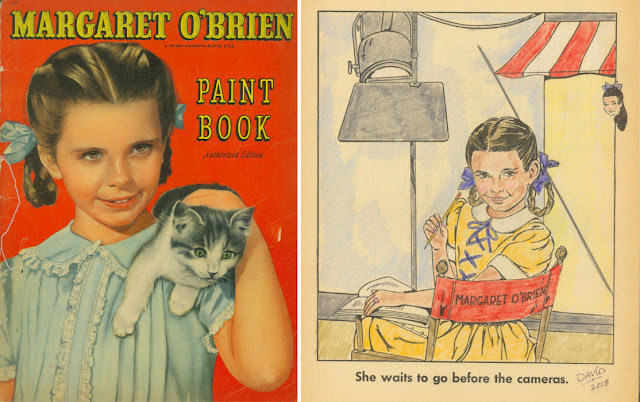 She was the child star of stars, a gifted little girl who could break your heart…and she often did, in movies like “Journey for Margaret” in 1942 when she was just 5 years old. Her most important role was as Tootie in “Meet Me in St. Louis.” She won a special juvenile Academy Award in 1944. Margaret was a stellar guest at the Los Angeles Paper Doll Convention a few years ago and I was thrilled to be seated at her table for dinner. She was delightful and still looked and sounded like the tearful little star that won movie goers’ hearts nearly 75 years ago. She gifted me with several autographed photos. 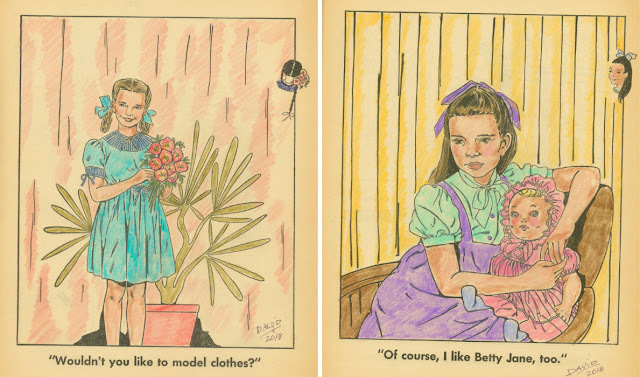 I recently received a 1947 Margaret O’Brien Coloring Book and this month, while coloring three charming pages I enjoyed recalling my conversation with the delicate little star. 1947 Margaret O’Brien coloring book and a pose on the studio set, colored by me. The famous child star of the ‘40s, dressed as little girls did, unlike todays jeans ‘n t-shirt kids. 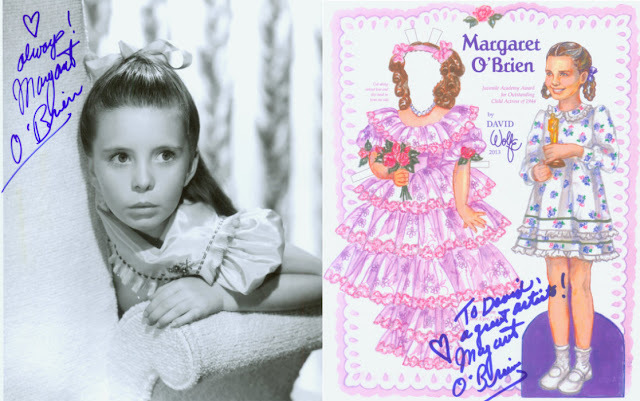 Pensive publicity portrait of Margaret and the paper doll I did that she autographed and inscribed to me. David's Own Op-Ed: Shame on the Stylist! Fashion has seldom been as chaotic and unflattering as it is now. Who’s to blame? You probably think that the designers are responsible (all are young except 84 year old Karl Lagerfeld at Chanel). Often, the designer has done her/his job well, creating interesting, sometimes lovely items, although always priced sky high. It is the Stylist who usually turns a pretty look into an unfathomable “total look” that makes no sense and is purposely put together to shock and disrupt. Take the current advertising campaign for Louis Vuitton. The model is fresh-faced and younger than spring time. She is wearing a museum-piece (not really) that is a very fancy metallic 18th century gentleman’s coat. Under the coat, the model wears a cheap-looking (but high-priced) striped cotton knit sporty shirtdress. She carries a silly little Louis Vuitton logo bucket bag and on her feet are edgy engineered white trainers that are as big as a hospital ship from outer space. If you think this is fashion madness, you’d be right but it is toned-down for the ad. The same outfit was shown on the catwalk with blue denim short shorts. Whatever happened to beauty, good taste and appropriate apparel presented to offer suggestions on how to look lovely, intelligent and self-aware? Louis Vuitton ad shows how stylists these days seem to be lacking style. I am continuing to work on my next book, “Merry Movie Christmas” featuring 12 paper doll characters from 9 Holiday-themed vintage movies. The cover is now finished, a wreath with ornaments embellished with little portraits of the dolls. I’m taking a short break while I move from coast to coast… from Long Island in New York to Palm Springs in California. I don’t expect to experience a white Christmas this year! 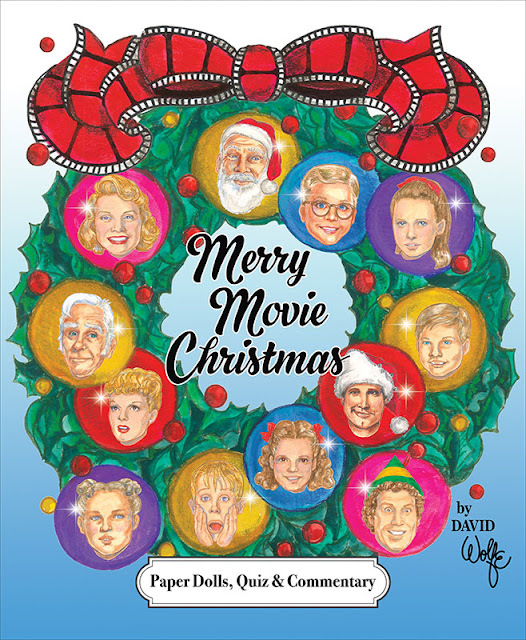 Final cover design for “Merry Movie Christmas” paper doll book due to be published in time for the Holiday season fun. Hoping to see you at this year’s Paper Doll Convention, July 4-8, 2018, in Seattle, WA. 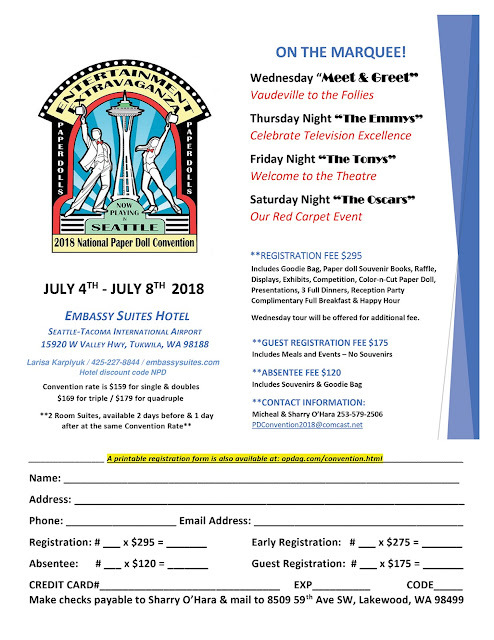 If you can't make it, you can join in on the fun with an absentee registration that includes a goodie bag, b&w color-n-cut paper dolls and 10 amazing paper doll souvenirs celebrating the convention theme, Entertainment Extravaganza! Click here for more information!